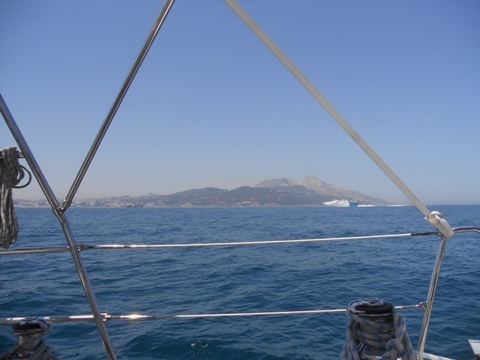 Leaving Ceuta, Mount Abyla in the background. Click the play button if you would like to hear some appropriate music: Unfortunately your browser does not support the audio element. Success! Destructive testing of £50! 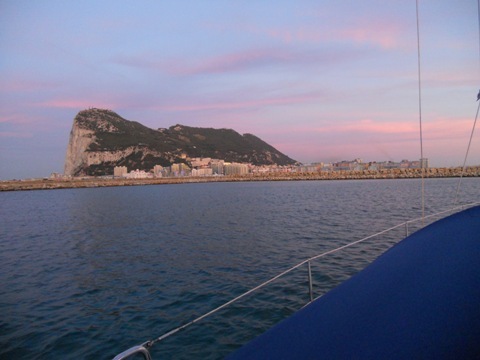 Our view from La Linea anchorage. 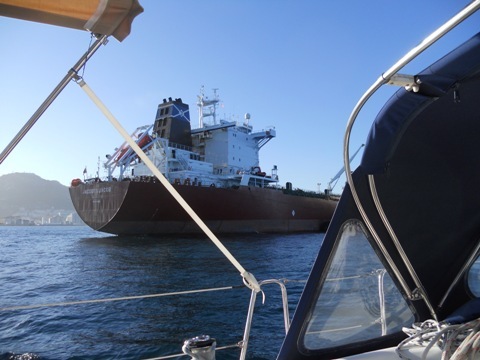 The forecast on Saturday was for lighter winds, and so it was when we got up at 0700, so we made our way to the CEPSA fuel pontoon in Marina Bay, Gibraltar to top up with cheap diesel. This is where the 'fun' began - there had been a minor oil spill in the bay, so the boom across the entrance had been left in place. 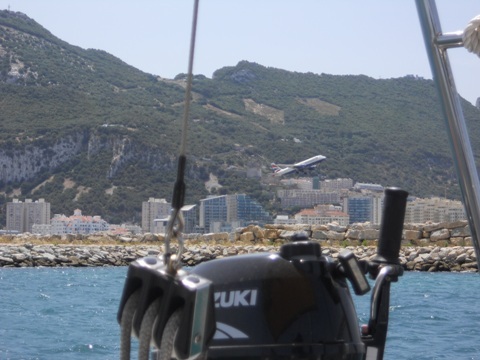 A call on the VHF failed to establish an opening time, so we returned to the anchorage in La Linea, in the hope that it would open sometime soon. It didn't. So we spent another night at anchor, with the hope that we could get away the next morning. We didn't. The Port Authority were rather vague with their information, but the radio operator at Marina Bay marina did sterling service trying to keep us and everyone else who were trying to enter or leave informed, and kept his sense of humour throughout despite some understandable frustration from some quarters. The word came through that the boom could be removed at 1200 for just 1 hour, so we made our way back from the anchorage just in time to hear that it had been delayed by 1 hour. So we hovered around the entrance as by the time we returned to the anchorage, it would be time to go back again! 1300 came and went, as did 1400, and a little later we heard that a patch of oil was still being dealt with in the bay, so we returned once again to the anchorage to await further news. Eventually we heard that the boom would be opened at 1600 for 2 hours, but this time we decided to wait until we had proof positive that it really was open. At 1630 we had this, and motored round once again to approach the fuel berth, whereupon when we told the port authority woman who was on the boat holding the boom open of our intention just to pop in for fuel and out again she said "NO YOU'RE NOT!" She grudgingly relented "if we were quick". We were, and returned once more to the anchorage. Although we did see a bit of oil in the bay, we didn't see as much as a single molecule anywhere near the marina, so whilst understandable that they were being cautious, it was all very frustrating. 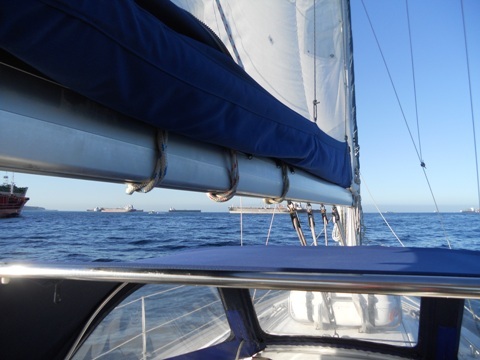 On Monday morning, with a forecast of F3-F4 in the Strait, we sailed out across Algeciras Bay in a gentle F2. Little did we know what was ahead of us... We had been told that the forecast in the Strait was usually one or two forces lower than reality, so we had headed out with 1 reef in the main sail in preparation. A little way out we soon needed a second reef and, before long, we were in a constant F7 gusting F8, now under a bit of genoa only. We had also somewhat underestimated the strength of the east-going current, so were being pushed ever further away from Ceuta. The waves were only about one metre high, but with the strength of wind and current formed lines of surf many times longer than Pipit. We took more water across the decks (and in my face) in those 3 hours than in the last 9 years of sailing put together. And I have never before had blisters from helming. Truly the most challenging 3 hours of sailing in my life, and that includes an infamous Hamble to Newhaven November night passage. All is calm leaving Gibraltar. 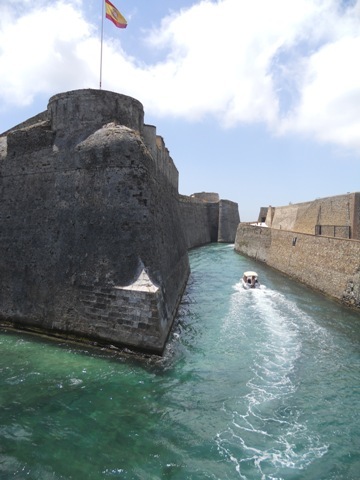 We eventually reached Ceuta, where the wind was now blowing a gentle 25 knots, and managed our first stern-to Med mooring fairly well, coming gently to rest fender to fender alongside another boat to leeward. Well almost fender to fender - unfortunately the other boat was a large Fairline Squadron motor boat, not ideal height-wise, but the French owners aboard were helpful and friendly. Our prize after our difficult crossing was a meal ashore but surprisingly we couldn't find a quiet tapas bar or restaurant we desired after our 'exciting' day, only noisy bars with tables and chairs outside in the main shopping street. 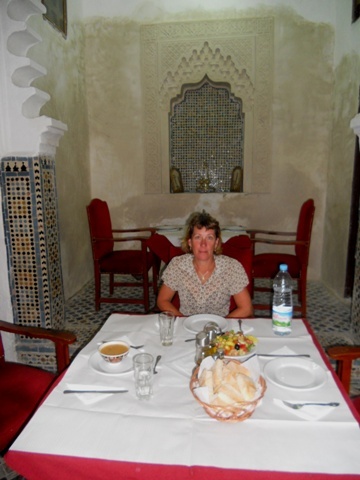 We were just about to give up when we happened upon a very nice looking Italian restaurant, not the traditional Spanish or Moroccan type of place we had in mind but very welcome at 10pm all the same. The pizzas we had (and Peroni beer) were delicious, as well they should have been as the bill was nearly €40! You can drive your boat round if it's small enough! 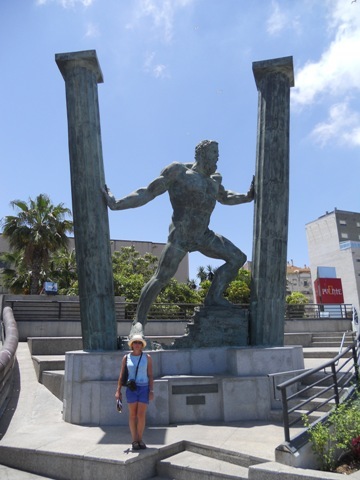 Statue depicting the Pillars of Hercules. We also visited the tourist office to find out about going to Morocco. A number of possibilities were suggested, and we returned to Pipit to mull them over. A bit later, whilst still mulling, a black Renault Logan pulled up on the quay and out jumped Ahmed, one of the official guides mentioned to us. 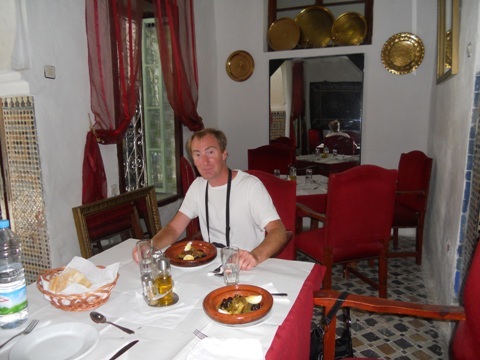 A deal was done to be driven to Tetouan with a guide the next day. 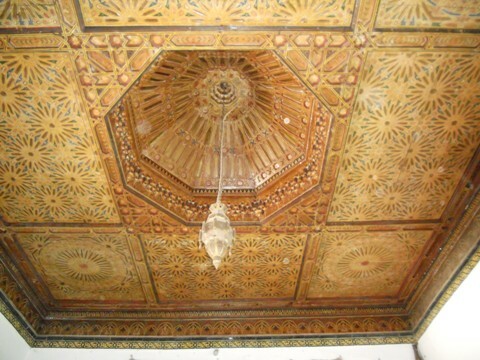 We were a bit apprehensive about our trip, not quite knowing what to expect, but Mohamed arrived at the specified hour and off we went by taxi to the frontier. Our crossing of the border was quick and, once in Morocco, there were acres of white Mercedes taxis of varying vintage. Not sure why but Mohamed picked one that seemed to have a family sitting in it, they were ejected, we got in and off we headed. 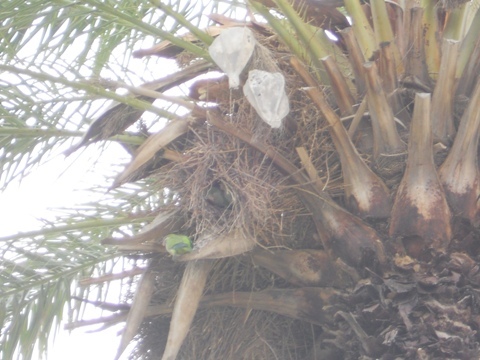 The taxi actually went, steered and stopped better than I (Andy) was expecting and the journey to Tetouan was quite pleasant, passing open countryside interspersed with new developments, including Smir Marina. 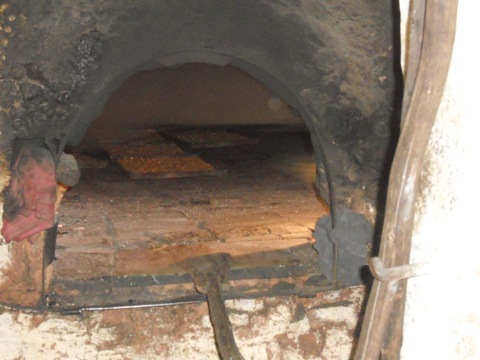 Peanuts being roasted in a wood fired oven. They smelled & tasted delicious! 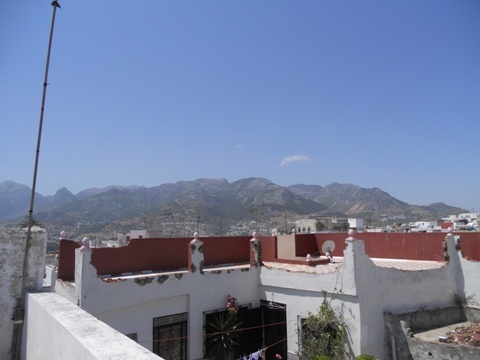 Rooftops of Tetouan with the Rif mountains in the background. 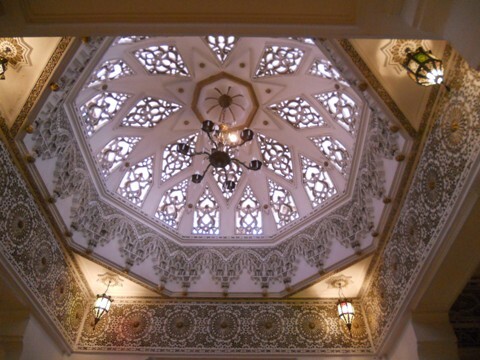 Impressive ceiling of 'carpet shop'. Us: "We live on a small boat." Vendor: "Good, good." Out came the blankets. Us: "They are lovely, but we live on a small boat." Vendor: "Good, good." 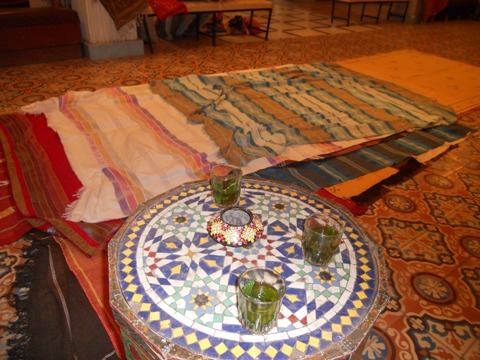 Out came the table cloths. 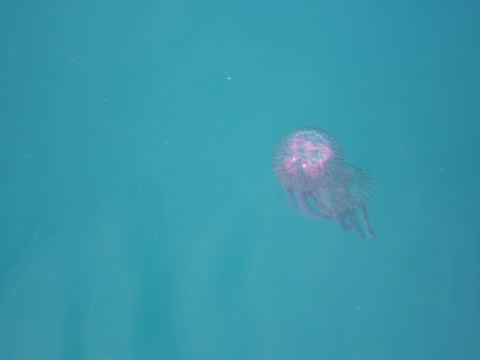 Us: "They are beautiful, but no good on our very small boat as they would slide around on the table at sea." Vendor: "Good, good." Out came the place mats. "Only €25." Us: "Lovely, but we don't need any thank you." Vendor: "Okay, you are my first customers today, only €15." Vendor: "Good, good." Now sensing that we didn't want anything material based, "Come, I have jewellery, crockery, clothes." And so we were obliged to view those too, but stuck to our guns and left empty handed. 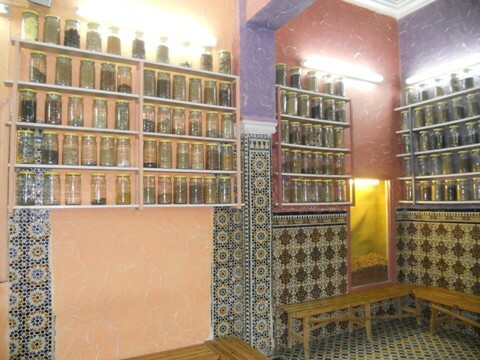 Next, at our request, was a visit to a spice shop - actually a traditional pharmacy. We were given a short explanation of various herbal health potions, and something to sniff - nigella seeds wrapped in muslin - apparently good for clearing the sinuses. But we were interested in spices for cooking and, after more interesting information, came away with saffron, cumin, Moroccan curry powder mix, another mixed spice for fish and chicken and some ras-el-hanout - a Moroccan blend of some 35 spices. We're looking forward to cooking with those. 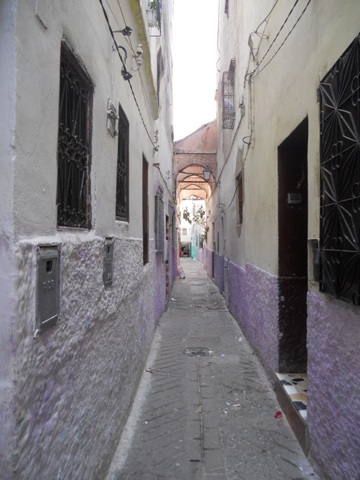 After a few more 'fragrant' alleyways, we told Mohamed we'd had enough and we made our way to a taxi rank, whereupon another family were turfed out of one of the newer looking Mercedes and we got in to return to the frontier. Once there our passage back into Spain was somewhat more painful and seemed to take forever but eventually we made it to the other side and returned to Ceuta in yet another taxi. 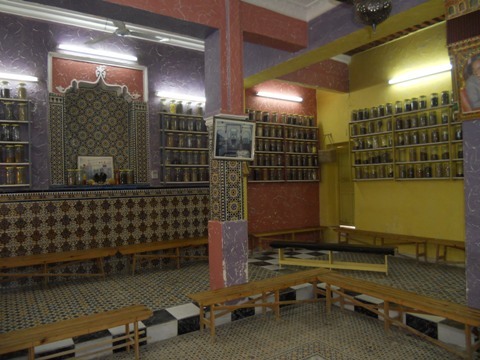 A stressful day, but with some memorable highlights and, in hindsight, we think we saw the 'real' Tetouan rather than a sanitised tourist version, even if we felt uncomfortable (but never threatened) at times. 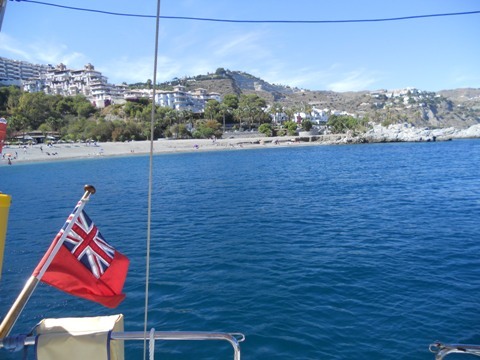 The next day was spent shopping and preparing for our return to Spain and, during the afternoon, Tony and Alison, fellow Lagos over-winterers, arrived and later we spent a very enjoyable evening aboard Reveller catching up over drinks & nibbles. I though we'd only been there a couple of hours, but it was nearly midnight when we returned to Pipit. Always a good sign, thanks again Tony & Alison. 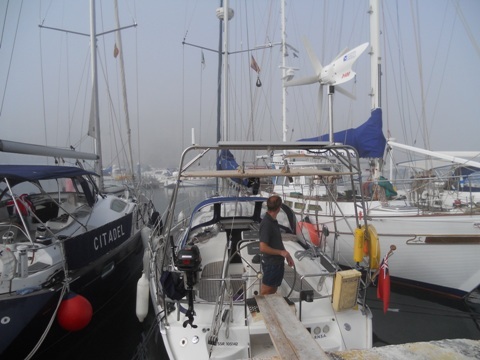 On Saturday morning we awoke to thick fog, not ideal for crossing the Strait of Gibraltar. 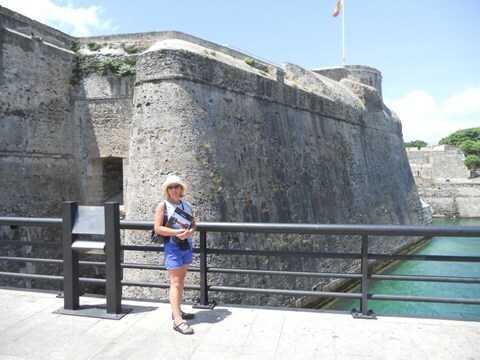 At 1100 it was looking like we'd have to stay in Ceuta for another day which we were not keen on as, compared with La Linea marina with its big new pontoons, big new showers and big new washing machines, was 50% more expensive. By 1110 the fog had completely lifted, and we were off! Our passage back to Spain was far less traumatic than the other direction but even so, despite the forecast suggesting no wind (we were happy with the prospect of a 3 hour motor) we had F6 in the middle. 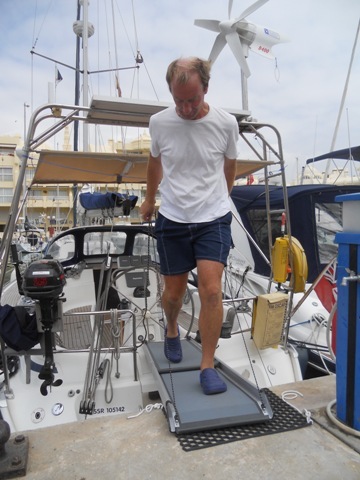 We made our way to Sotogrande where we anchored off the beach and had a tranquil evening but slightly rolly night. As close as we passed to Europa Point. Our last view of Gibraltar from the anchorage at Sotogrande. Beautiful anchorage at Punta del la Mona - we did swim here, all the way to the beach in fact. 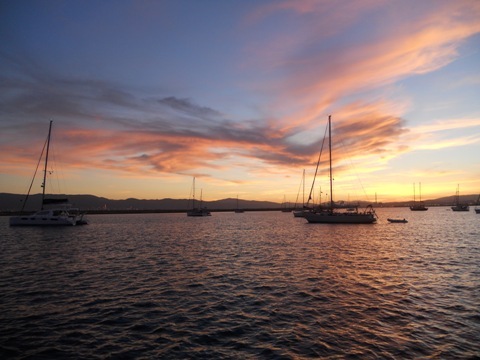 The marina is reportedly very nice, but expensive. 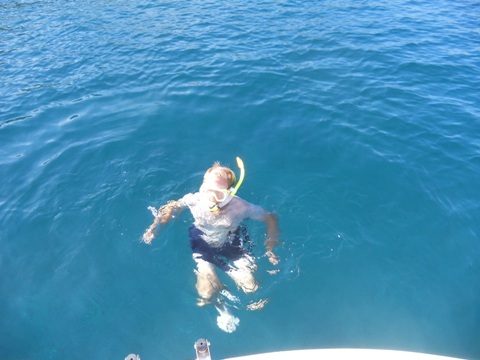 Andy snorkelled for the first time - well we are in the Med proper now (although Ceuta is technically) and could see lots of fish and the anchor in 8 metres of water. 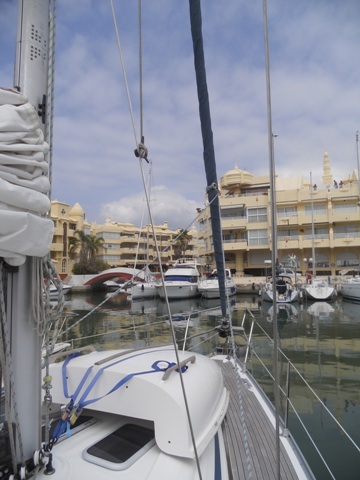 So it's been a week of passage making, and we're pleased to have arrived at Almerimar already. 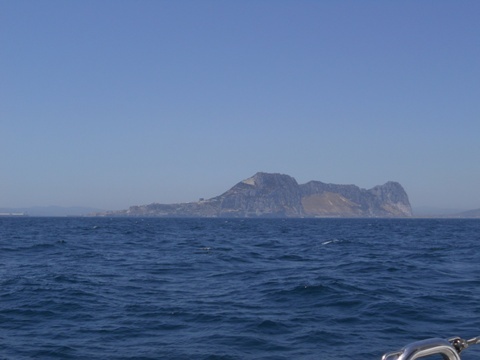 We've motored more than we would have liked in glass-like seas, but also had an extremely unpleasant passage from Punta del la Mona to here yesterday - F7 and large breaking swells following us. 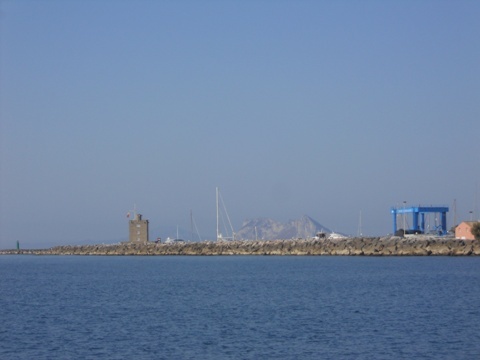 We've also been to marinas more than planned (at Benalmadena and Caleta de Velez) as the adjacent anchorages there had swimmers' yellow buoys a long way out from the beach, meaning we couldn't tuck in behind the breakwaters for protection from the south-westerly swells. Fortunately they were both reasonably priced. 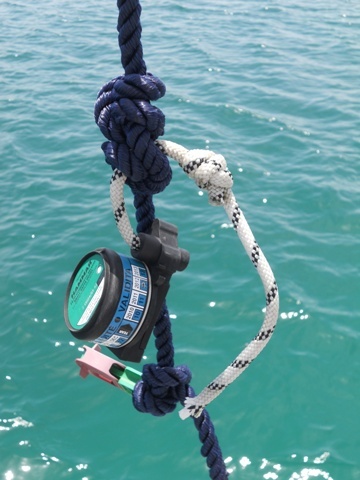 We have also derived a certain perverse pleasure from being anchored off some places that we wouldn't naturally choose to set foot in! 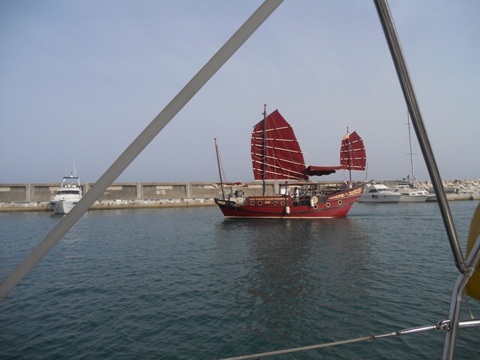 We'll stay here in Almerimar for a week or so to stock up and attend to the ever present list of jobs to do aboard Pipit.